This would most probably be the first interview Ollie Lang did after the big announcement last Sat (Singapore morning) that he is going back to his old team Dynasty. Within minutes after Ryan Greenspan tweeted "Welcome Back Mr Ollie Lang" I knew that the move was on and tweeted it and I sent Ollie a few questions about it. Ollie has graciously replied my email with answers and here we have a World Exclusive: Ollie Lang talking about this move back to Dynasty. Hi Ollie thank you for doing this short but very important interview. 1. What-when-how was the decision made - who did you speak to in Dynasty? I have been speaking to Alex (Fraige) about it for years, partially joking but in the back of my mind- seriously. 2. What are your thoughts going back to the team that started it all for you? Its just nice to be back with my friends that I started with. 3. This move is obviously not about money, what is it about? Going into a title contending team? Its about a fresh start and a new goal, its time to revive the sport. I want to triple stamp the double stamp that we were and are the best ever to play the game. 4. Do you have any message to Ironmen and Dynasty fans out there ? Both teams are great teams and it is amazing that there is a sportsman that has two teams. I really have two teams and two great teams at that. Whether you are an Ironmen fan or a Dynasty fan, I hope that you are an Ollie Lang fan and I will continue to do my best as an athlete to represent the sport and grow it as much as possible. Look out for the best to come. Thank you again Ollie for answering my questions. We look forward to seeing you and Dynasty on the field. Noob - A new player. Nub - An experienced player who exhibits the characteristics of new players. So what do you call a player* who tried to 'chono' by shooting the chronometer? Had these pictures since last week I thought I'd put them up before they get too old. 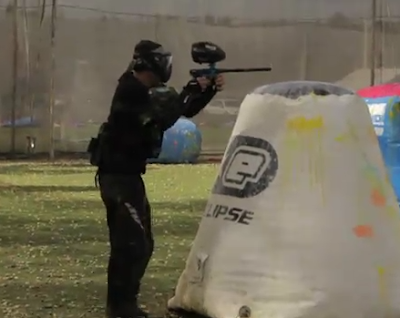 In paintball things get old pretty fast especially with the internet. Every year I wait to see what jersey and marker Marseille Icon from France comes out with. 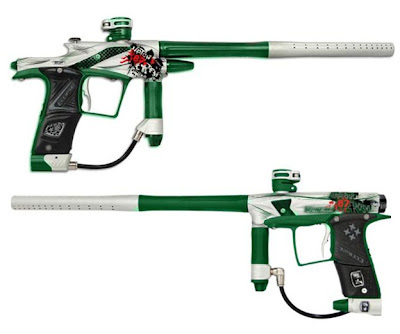 And this is the 2011 Icon edition Ego11 and Geo 2 with their legendary green and Wolverine logo. Lets have a quick look at the Marker sponsorship situation in the all important Pro division going into the opening NPPL Event in April. For 2011 the NPPL will cap Professional Division at 16 teams. So far to date there are 15 teams confirmed with 1 spot left. 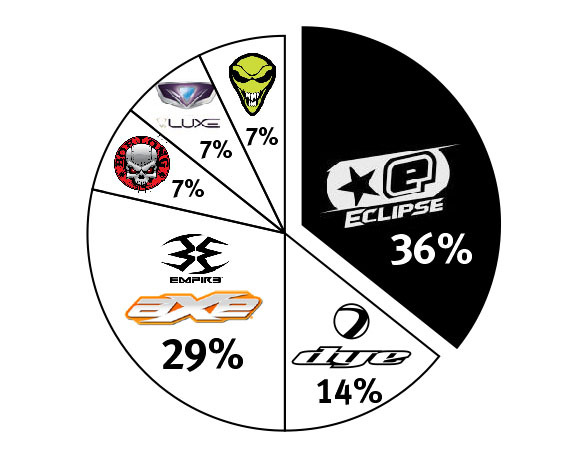 Planet Eclipse 36% had the biggest slice of the pie with 7 teams last year in Pro but have lost 2 teams to Empire. They still managed to hold on to the biggest slice of the pie at 36% with 5 teams. Planet Eclipse managed to hang on to big names in Dynasty and Impact. San Francisco Explicit, St Loius Avalance and Chicago Aftershock stayed with Egos and Geos. They were the biggest losers in terms of pro teams- they have been losing teams since 2009 when long time Eclipse shooters XSV and Infamous left. Empire 29% has come and taken a big bite from Planet Eclipse in the Marker Sponsorship Pie. New comer Empire grabbed 4 teams with their new Axe XSV (from Alien) Infamous (from Bob Long) and signed up 2 new teams Chicago Legend and Vancouver Vendetta. They immediately have almost 30% of teams share in Pro division showcasing their new Axe. Dye 14% has the smallest pie of the big 3 manufacturers with only 2 teams at 14%. However they still have overall the 2010 Champions Tampa Bay Damage and DC Arsenal shooting Dye NTs. Dye has been more supportive of teams playing in the PSP with its Ironmen not playing in the NPPL. Bob Long 7% lost Infamous to the Axe but he still has house team Oakland Blast to concentrate on. Alien 7% had XSV last year and managed to stay in Pro Division with new team Seattle Thunder. 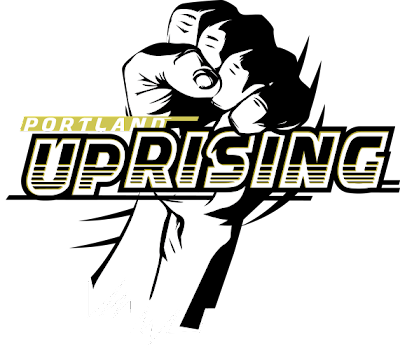 Portland Uprising remains the only team left unsigned to any marker manufacturer. Portland Uprising announced yesterday on the 21st Feb that they have officially acquired an NPPL Professional spot for the 2011 season. 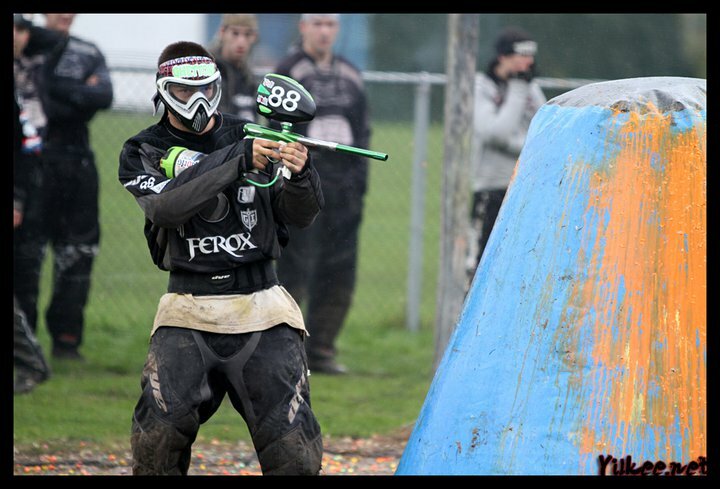 Formed in 2004, the team competed in the NPPL Semi Pro bracket in 2007 under the name WA Uprising by PBRack.com. Uprising will be made up from players from the PBRack staff and teams. 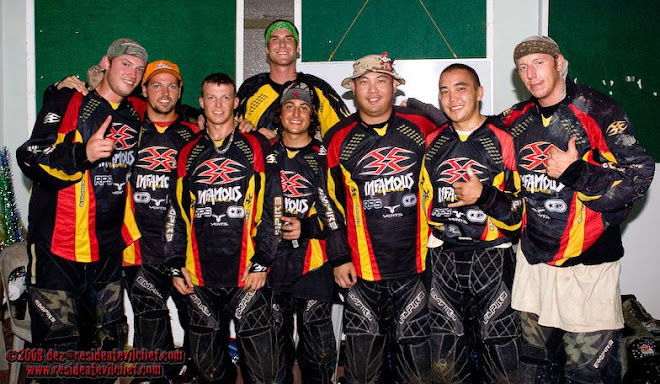 Some of the guys came out to play and won PALS Philippines last year. Uprising will be wearing head to toe PBRack on and off the field this season. CHANNEL H's exclusive footage of Oliver Lang's first practice back with Team Dynasty for the 2011 Season. Follow Mr. H as he interviews and enjoy the game footage from yesterday! Ollie wasn't in a Dynasty jersey for real but in a black t shirt. He was however, wearing an Empire mask and still wore his Dye pants and Dye Elbow Pads. And shooting a Blue GEO with a Dye Rotor and not a Empire Prophecy. In fact the WHOLE TEAM are all using ROTORs. Mr H also reveals that Tyler Harmon has joined Infamous. 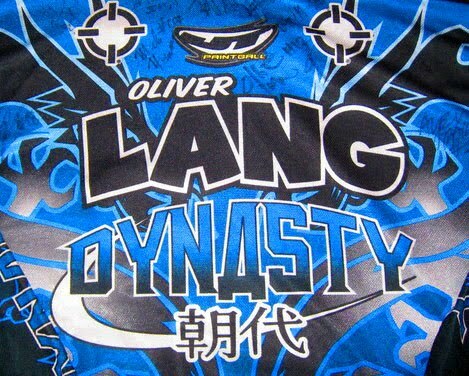 OLIVER LANG IS MOVING BACK TO DYNASTY. Its Sat 19th 1230pm Singapore time and Fri 830pm LA time. So far nothing on PBnation, Propaintball and Facefull Im the only one with this. Let see if the others catch up and confirm or I jumped the gun. Oliver Lang has been out of contract with Dye since the end of last year when his $100,000-a-year contract ran out. It has been 5 years since his legendary move from Dynasty to Dye/Ironmen. During the World Cup Asia last Nov Ollie got to hangout with his old buddy Ryan Greenspan and I'll bet $100,000 that he and Ryan talked about it. And ironically it was Ryan Greenspan that tweeted the announcement first before Ollie. During World Cup Aisa when Ollie was asked if he was going back to Dynasty he didn't deny the rumours- his answer was a definite "maybe"
Rumours have been floating around since late August last year that that he was not been offered a new contract with Dye nor has he signed a new one. Thus it was logical that rumours of a move out of the Ironmen was imminent. Only last week it was reported that he was seen practicing with the Ironmen thus squashing rumours of him moving out. It seems that the decision to make the move was made only in the past few days. Looking at the choice of title contending teams that he can move to or willing to take him in...There isn't much around. He wont suit the Russians, not sure about Oakland Blast, Infamous are taking a big risk with the Axe. 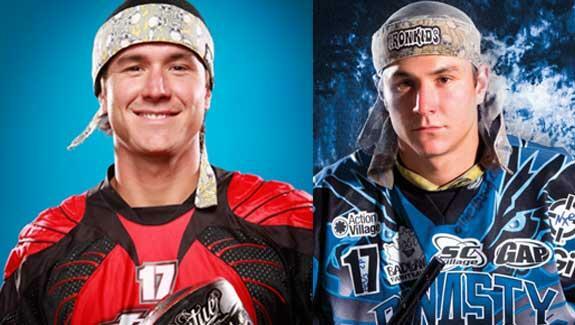 If Ollie was going to move - it would not be for money because I doubt any other team or sponsor can top what Dye paid him. The move was definitely going to be to a team that can win. It won't be a move to another Dye team like Tampa Bay because if he was going to be a Dye player - Dye would want him to be in the Ironmen. Dynasty would be the most logical choice since he grew up with the team and it was with Dynasty that they wont all those Championships. Dynasty has not been as strong since their rebuilding process with the inclusion of the younger players and with Ollie things could change for the better. 1255pm OLLIE LANG HAS CONFIRMED IT ON TWITTER! About his move to Dye from Dynasty. 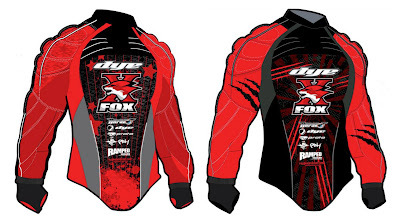 Team X FOX is one of the oldest team around in Malaysia. They have been a Dye/Proto team from the very beginning. So its no surprise that they have been selected by Dye to have their own custom C11 jerseys. The jerseys have been designed by PBH Paintball Heaven. They have yet to post the third design but between the 2 above my vote is for the black one on the right. 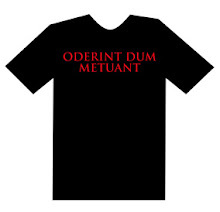 I cant wait to get mine! 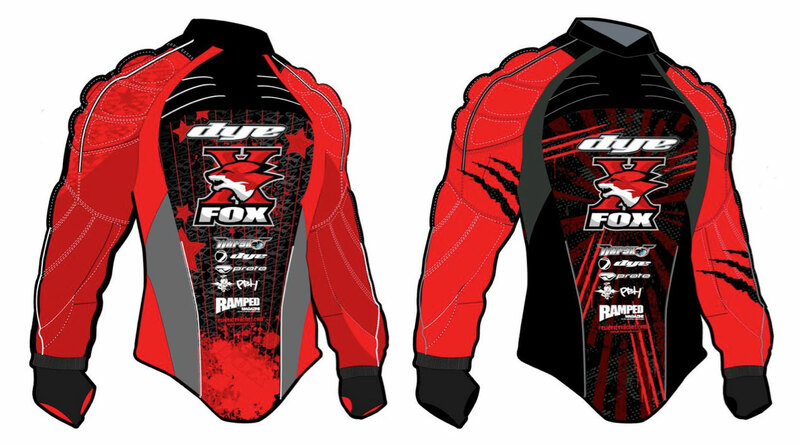 "We shall post up to 3 deisgns for our 2011 custom jersey....click like or comment the design & we will do a draw for 2 lucky winners (win yourself Limited Edition Team X-FOX 2011 T-shirt & Headband) by 4th Leg MPOC!!" 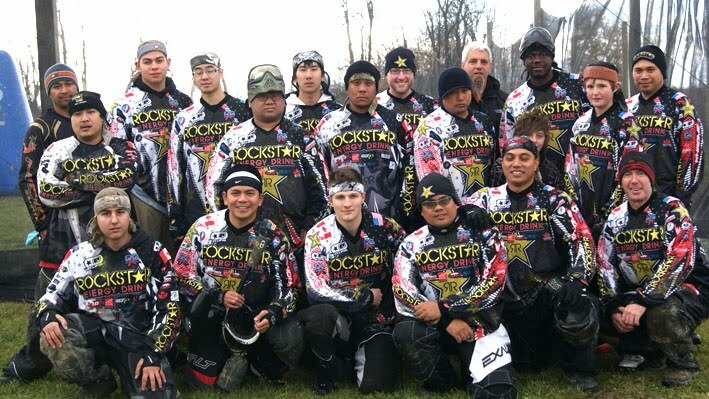 ROCKSTAR FACTORY TEAM has a Canadian team that plays in Div3 in Canada and USA. Their jerseys are slightly different from their USA counterparts (who used to play in Semi Pro). 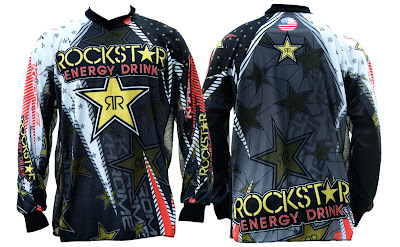 The Canadian rockstar Factory team jersey have red trimmings on the sleeves and a Canadian Flags on the shoulders and back. 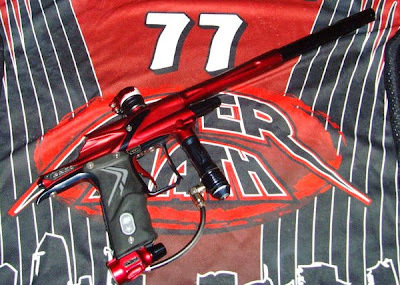 Anthony Portier I love your set up. This marker is up for sale on Team Ferox's Facebook. 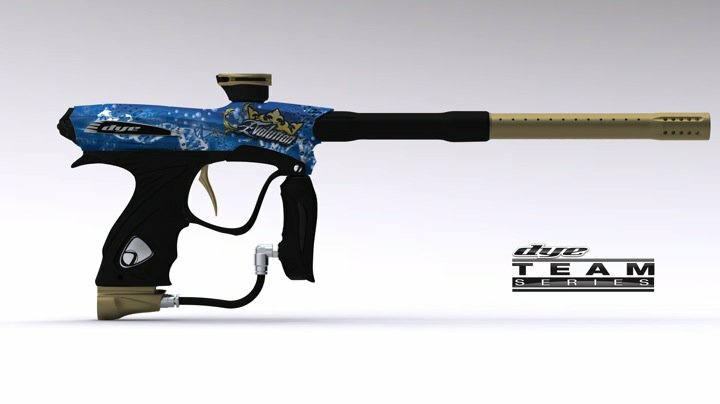 I was intrigued by this new "independent" marker dubbed the ROGUE made by Californian based company Hostile Creations. 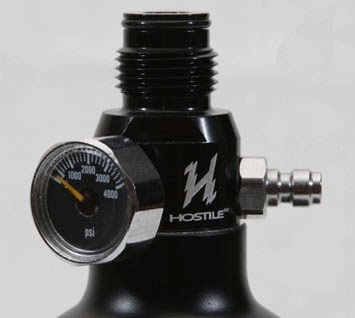 Hostile Creations also make tank regulators and this one looks....familiar? 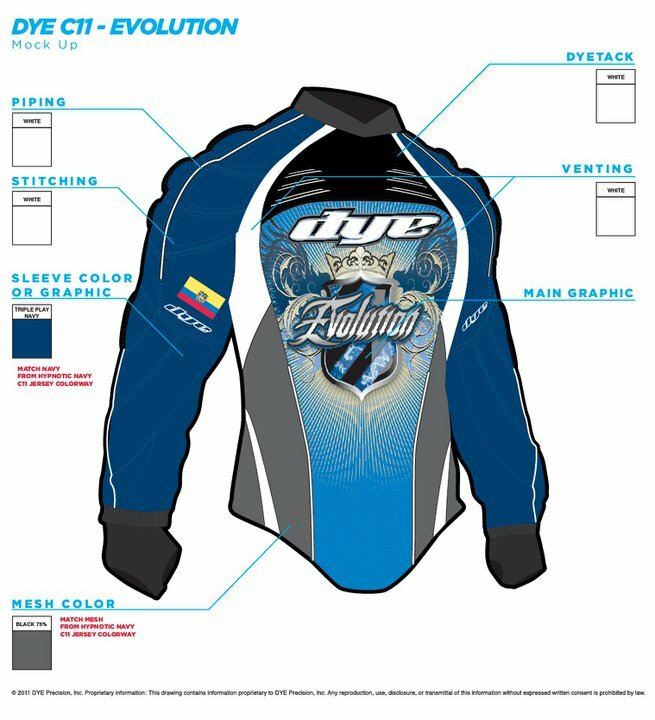 Another big Dye team from Equador is Evolution which I featured their custom C10 jerseys in my blog last year. For 2011 they have put up 2 designs for their fans to vote on Facebook. I vote the first one above over the gold trim one below. 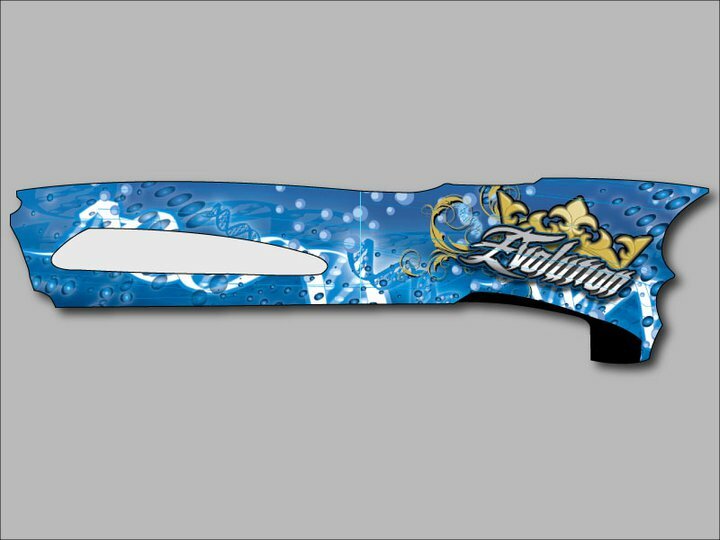 The Team Evolution Dye Team Series NT11 is really nice with their signature blue/gold trim. If the final jersey is the one on top then the trims on the NT11 should be in while or silver. But judging from the looks of this picture - I think the C11 will be the one with gold trims. 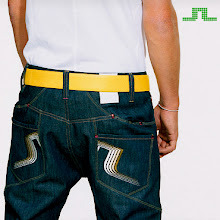 The original design is quite faithfully replicated on the actual NT11 marker with its PGA technology. In the light of custom jersey makers offering good quality work from the likes of TANKED, S2, RAZA etc. The current fashion is all about custom jerseys and stock jerseys are not good enough. As a result of this companies like DYE who usually dont make a custom jersey unless you are a pro team, have changed their policy and are offering selected DYE teams the chance to customised their own jerseys and Markers. 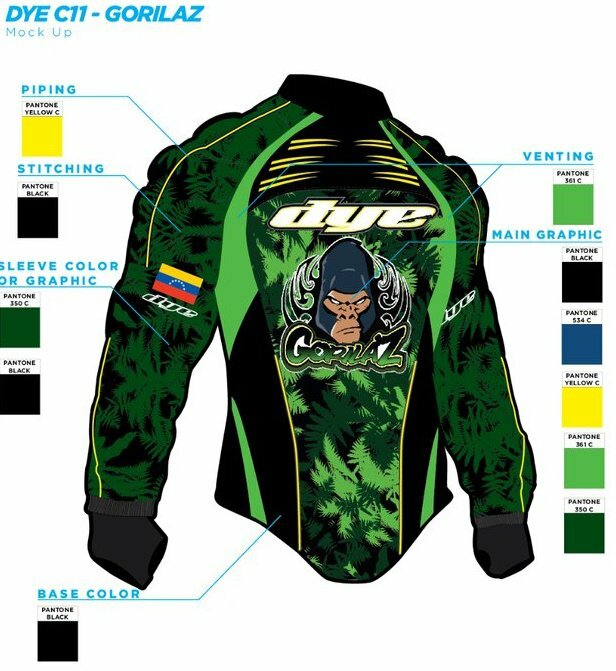 Here is a draft version of the first non-professional team Dye C11 custom jersey for Team Gorilaz which is a team from Venezuela to appear on the net. Cult team L.I.F.T.from Long Island New York signed with Dye recently and this is their customised NT11 which is really sweet. I'm sure we'll see one from the New Jersey Jesters too. 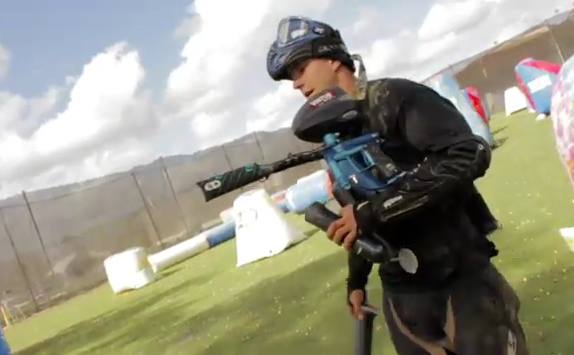 Paintball for the X Games? 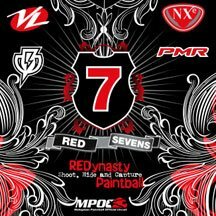 Propaintball reported that the NPPL is currently in talks with ESPN to get Professional Paintball back on mainstream TV again. Paintball was last seen on TV on "Beyond The Paint" which was co produced by ESPN and the 'old' NPPL which was previously owned by defunct Pacific Paintball and when Pacific dent bust so did NPPL and thus the TV show also disappeared. Its no big surprise that the NPPL is talking to ESPN again and this time I am hoping that the results would be more than just a lifestyle program which was what "Beyond The Paint" was. 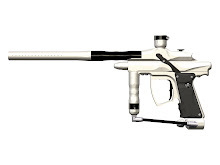 I am hoping that it'll lead to paintball being incorporated into the highly popular X Games. Up till now all x Games sport have been individual sports and paintball would be one of the first sport that has a team element to the X Games. 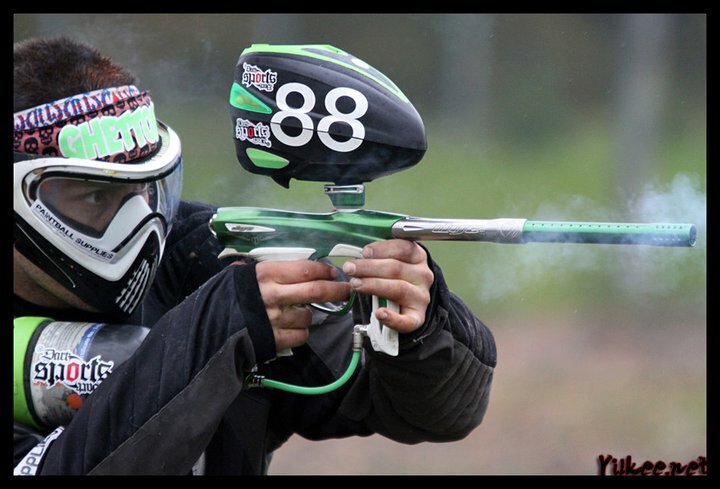 I have always believed that Paintball has a better chance of getting into the X Games than getting into the Olympics. 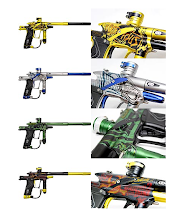 Furthermore Paintball will grow better and faster and in the right target market in the X Games compared to the more rigid and mainstream Olympics. 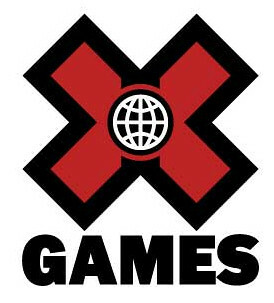 So yes I am definitely keeping my fingers crossed and hoping that the meetings with ESPN will somehow lead to Paintball being included in the X Games. My only concern with the NPPL being the one talking to ESPN is that I think the PSP format would be more TV friendly compared to NPPL's & man. 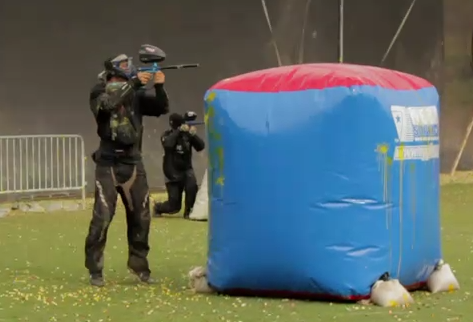 But I'll take any format on TV as long as we get to watch Professional Paintball on TV.